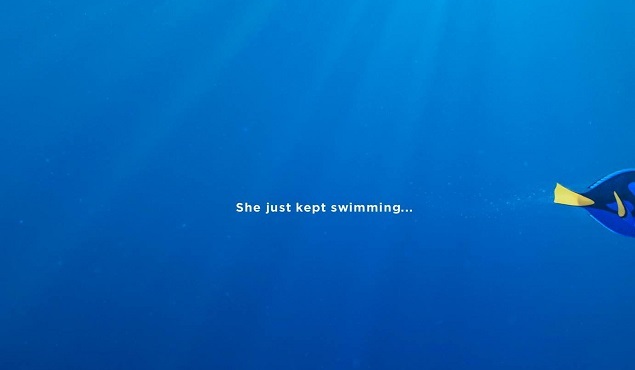 Home / disney pixar / featured / finding dory / finding dory trailer / finding nemo / Gaga On Social Media / movie trailer / First Look: "Finding Dory"
The phrase "Finding Dory" trended worldwide because of this poster. Thirteen years after Finding Nemo, we are submerging underwater again with this most anticipated sequel schedule to hit the big screen on June 17, 2016. Ellen DeGeneres reprises role as Dory, a forgetful Pacific regal blue tang. Taking six months from where the first film ended, Dory suddenly recalls her childhood memories. Remembering something about "the jewel of Monterey, California", accompanied by Nemo and Marlin, she sets out to find her family. From there, this underwater adventure which is set to drown box office records, began. Here's the 100-second exclusive first look uploaded by The Ellen Show YouTube channel. Everyone's favorite forgetful fish is back! The Ellen Show shared the exclusive first look at the much-anticipated film on YouTube. Watch!